Step right up to budget toss! Did you know that if tuition rates continue on their current trajectory students entering grade primary today will be looking at upwards of $20 000 per year in tuition fees by the time they enter their post-secondary education? Post-secondary education costs have become a major bottle neck in the Canadian economy. The debt incurred by students is forcing youth to put starting a family or buying a home on hold which has served to stunt the growth of the Canadian economy. We are provided a laundry list of excuses from government and business about how students have a "skills gap" while corporations have cut funding for on the job training. What has been the neoliberal response to bridging this skills gap? Rather than providing an equitable solution by working with businesses to ensure that they provide on the job training the costs are directly downloaded onto students in the form of unpaid internships. Unpaid internships which have been proven to be less effective in terms of individuals long-term employability when compared with paid internships, co-operative programs, or entry level positions. So now not only are students faced with an increasing debt burden but we're also told that it is our responsibility, upon graduation, to work for free in order to close this skills gap. We're also told to stop taking useless degrees with unlikely job prospects. But the fact is even in IT, sciences, and professional programs the skills required to effectively work in these fields are constantly changing. The business world is so diverse that we can't realistically expect universities to provide students with the specific skill sets to meet the unique demands of each and every individual business. Corporations have also cut spending on research and development, opting instead to use publicly funded post-secondary institutions and student researchers to develop new products. Once students graduate they are faced with dismal employment oppurtunities because jobs in research and development that would otherwise exist are being undertaken by university which is largely funded by public money. This model of research and development has produced embarassing results. According to the Centres of Excellence for Commercialization Research of the 500 projects which were publicly funded in the last ten years only 80 were identified as commercially viable, half of which moved forward. This means that Canadians have funded 460 projects which failed to produce any marketable results. The successful projects have no financial benefit to the public as they are brought forward by private corporations after the research and development phase is completed. The Canadian Federation of Students is currently in Ottawa lobbying MP's and senators to move forward with policy recommendations which address these concerns. While there has been a recognition that rising tuition costs are a problem, government officials have been reluctant to move the student agenda forward. 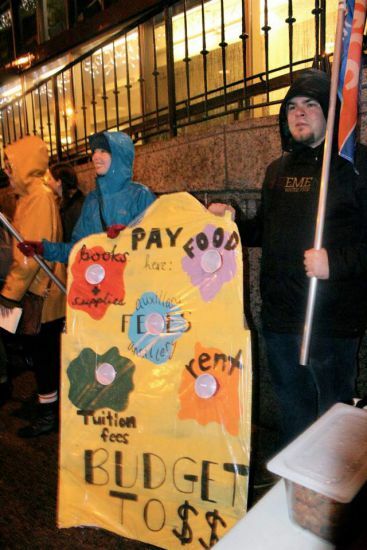 On Monday November 17th nearly 80 students rallied outside the Halifax World Trade and Convention Centre in the pouring rain arguing for free post-secondary education. In Nova Scotia our province is a net importer of post-secondary students, however, post-secondary funding is dictated by the number of students who graduate from high schools in the province. This causes a discrepancy between the amount of funding available and the number of students who attend post-secondary institutions in Nova Scotia and creates a need for a post-secondary education act to ensure that adequate funding from federal transfer payments is allocated to post-secondary education. It remains to be seen if the student movement will be able to gain traction with their most recent campaign but I urge you to show your support by talking with students and discussing this problem in order to further these pressing issues and uncover ways to resolve them.